Most people will have played Tenpin at least once. This makes Tenpin not only a known commodity but a destination activity. But if Tenpin bowling makes you think of Fred Flintstone and Homer Simpson, think again. It’s been reinvented as the groovy new sport in Sydney and Melbourne. There are actually three times as many bowling centres in Australia now as there were in the 1960s, and given that in the intervening years many of them closed down, that’s quite a renaissance. Your venue can capitalise on the proven concept of bowling and the current resurgence of the sport as a leisure activity. With “string setter” machines and other precision bowling equipment, we can provide Tenpin lanes at approximately 40% less than free-fall pinsetter lanes. Additionally, no mechanic is required to be on duty for string setter lanes greatly reducing your operational labour costs. Not only are lane establishment costs substantially less but running costs are reduced by an even greater percentage. A modern bowling centre should not look like a converted factory. Glow in the dark lanes and equipment along with computerised scoring and graphics have made bowling a twenty first century sport. With our modern scoring system the range of games and graphics can be suited to the age group and the occasion. 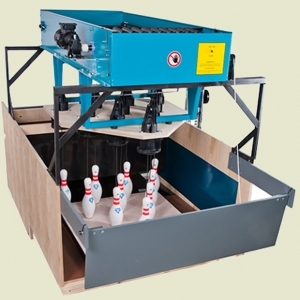 We can offer Tenpin equipment in two different styles, like the conventional system with underground ball return and ball lifter or with above ground ball return.